As we have seen, two of Jacob and Fannie Goldsmith’s fourteen children died before 1910, George (1899) and Emma (1902), and four more died between 1910 and 1919: Leonora (1911), Ellena (1914), Rachel (1915), and Felix (1919). The seventh of Jacob Goldsmith’s children to die was his youngest son Edward. 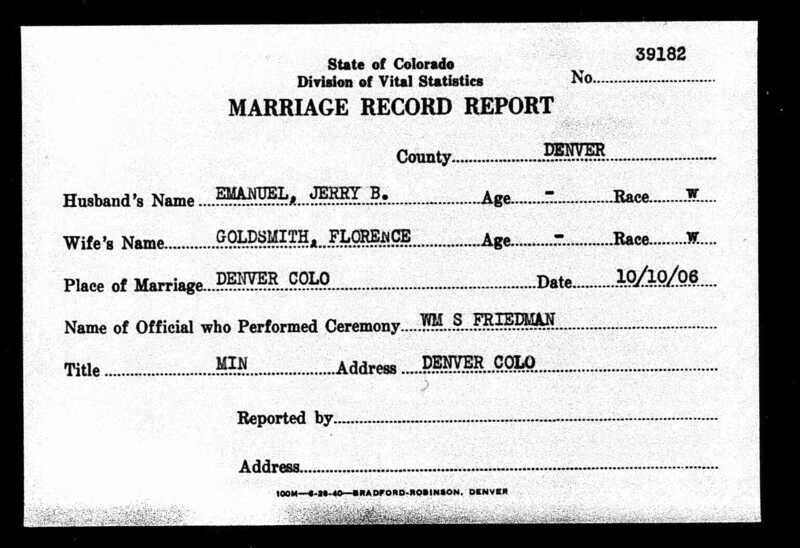 On June 21, 1936, Miriam married Armand Rice Hecht in Cincinnati. 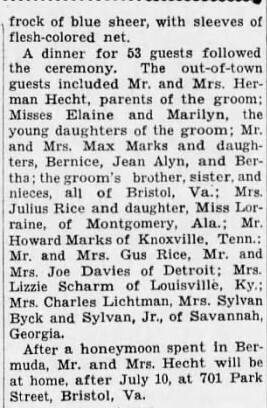 Their wedding was written up in the Cincinnati Enquirer on June 28, 1936 (p. 63). I found it rather sad that there is not one of Edward’s relatives named among the guests at the wedding. 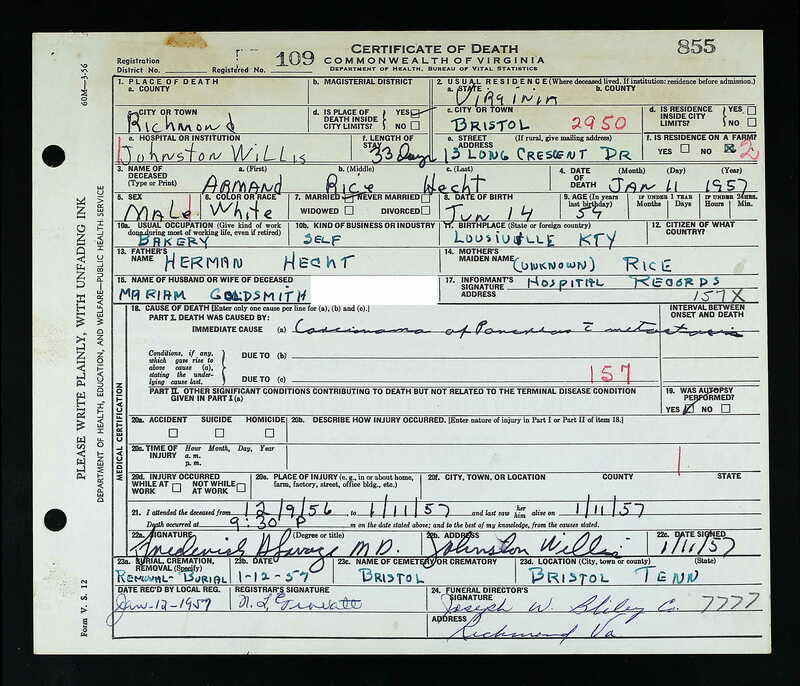 After Armand and Miriam married, they honeymooned in Bermuda7 and then settled in Bristol, Virginia, where they were living in 1940 with Armand’s two daughters from his first marriage as well as their own daughter and Miriam’s mother Hannah. Armand was the vice-president of a baking company. Armand died on January 11, 1957, from pancreatic cancer; he was 54. With Edward Goldsmith’s death in 1920, half of Jacob Goldsmith’s children had passed away. There remained seven more: Annie Goldsmith Frank, Celia Goldsmith, Frank Goldsmith, Rebecca Goldsmith Levy, Florence Goldsmith Emanuel, Gertrude Goldsmith Emanuel, and Eva Goldsmith Uhlfelder. Where were they in 1920? 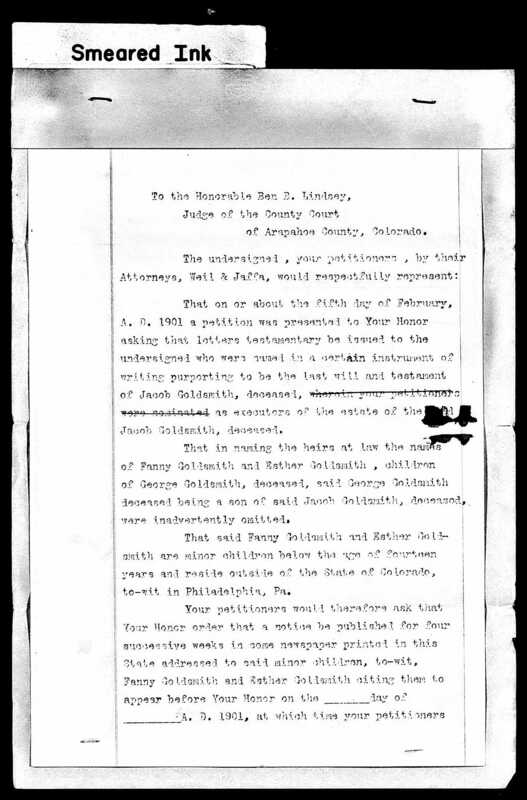 In 1920, Celia Goldsmith was living with her younger sister Eva Goldsmith Uhlfelder and her husband Sigmund and son Sidney in Albuquerque, New Mexico. 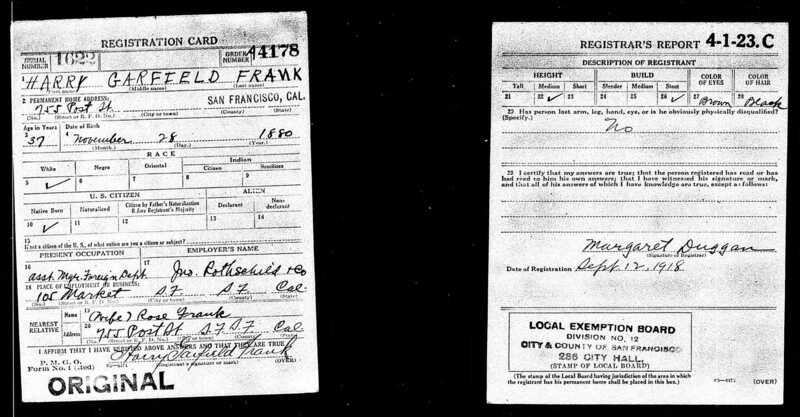 Sigmund was working as an accountant for a department store there. 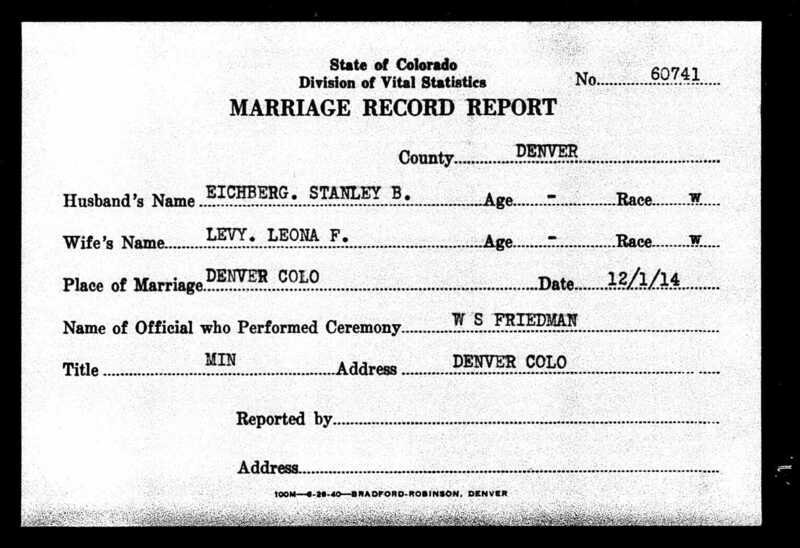 Rebecca Goldsmith Levy’s daughter Leona was married to Stanley Beckwith Eichberg on December 1, 1914, in Denver. 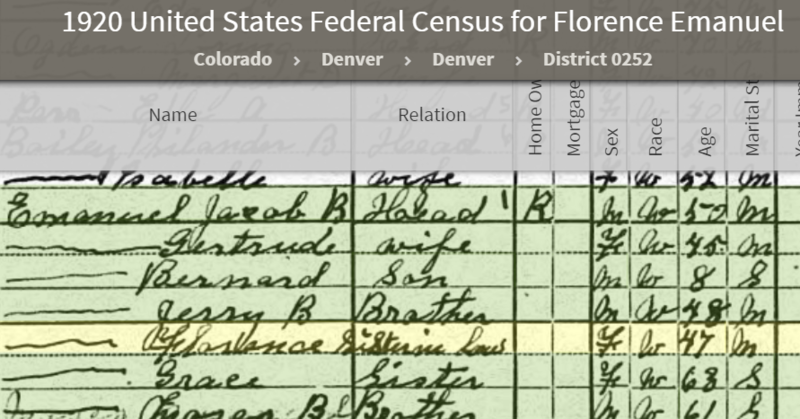 The remaining two Goldsmith siblings, Florence and Gertrude, were also living in Denver with their husbands, the brothers Jerry and Jacob Emanuel, respectively. They were all living in one household along with Jacob and Jerry’s siblings Grace and Moses and Jacob and Gertrude’s eight year old son Bernard. Jacob was a merchant of men’s furnishings and Jerry a car salesman. 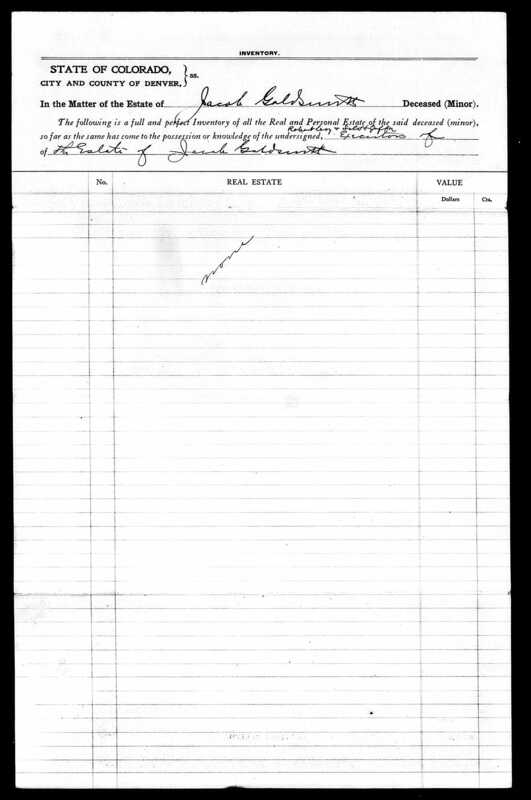 Thus, in 1920, the six daughters and one son of Jacob Goldsmith who were still living were scattered across the country with only Frank still in the east. Three sisters were in Denver, two in Albuquerque, and one in San Francisco. What would the Roaring Twenties bring to these seven surviving siblings? 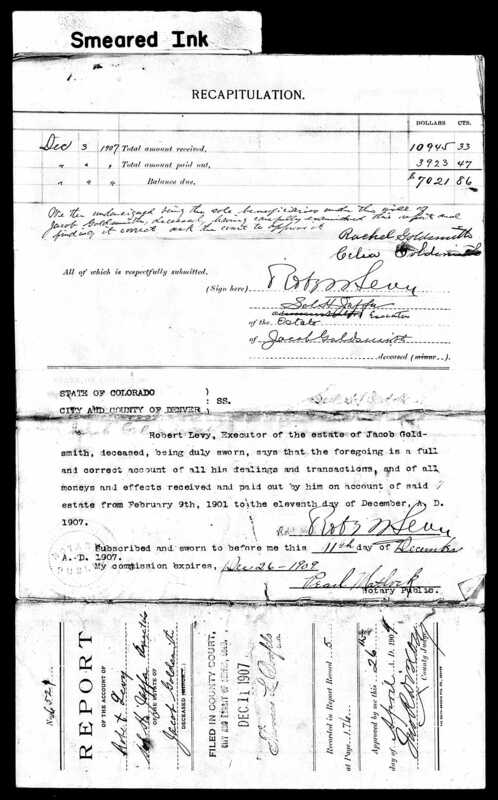 “Pennsylvania, Philadelphia City Death Certificates, 1803-1915,” database with images, FamilySearch (https://familysearch.org/ark:/61903/3:1:S3HT-676K-YG?cc=1320976&wc=9F51-VZ9%3A1073329301 : 16 May 2014), 004050474 > image 633 of 1820; Philadelphia City Archives and Historical Society of Pennsylvania, Philadelphia. Like his father Simon, Jacob Goldsmith had lived a rich and interesting life. 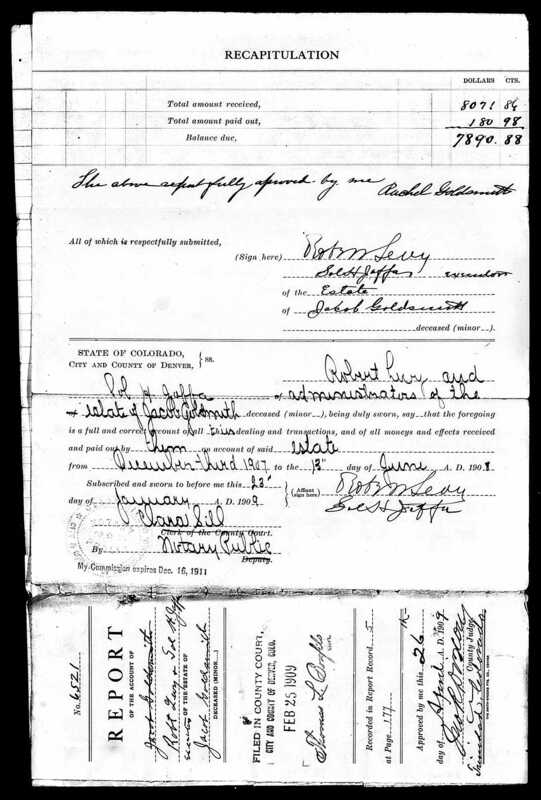 He was born in Oberlistingen, Germany, and after his mother died in 1840 when he was just a teenager, he immigrated all alone to the United States. 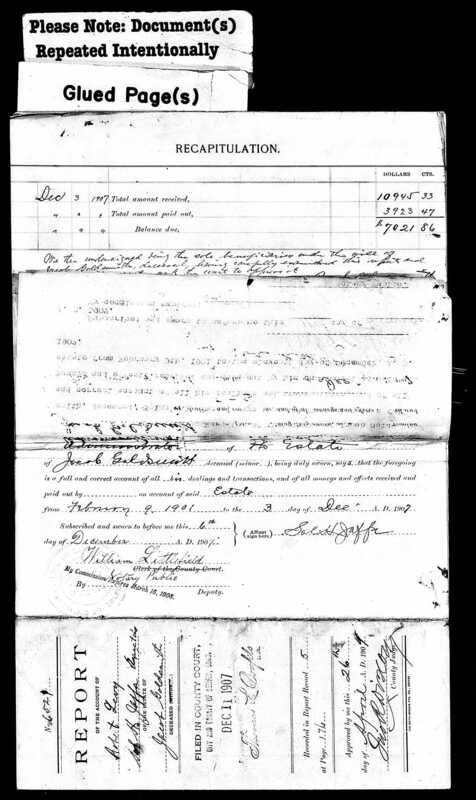 He was the first of the Goldschmidt clan to come to America. He settled in Washington, Pennsylvania and established himself as a clothing merchant there. He and his wife Fannie started their large family there in 1853. After his stepmother Fradchen passed away, Jacob opened his home to his father Simon and his two half-siblings Henry and Hannah. 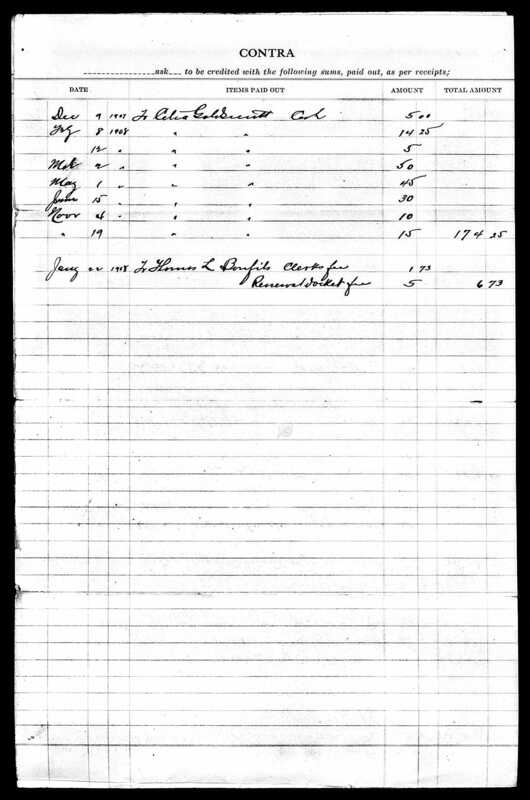 Then in the 1860s, Jacob and Fannie and their many children moved to Philadelphia where Jacob was again a clothing merchant; he lived there until Fannie died in 1881. After her death Jacob joined his half-brother Henry back in western Pennsylvania where he established yet another clothing store in Connellsville. Jacob’s final move was to Denver, Colorado, when he was already in his sixties. Jacob Goldsmith was survived by thirteen of his fourteen children and seventeen grandchildren, plus three more who were born after he died. His love and care for them all was revealed in his will. Six of his daughters—Emma (47), Rachel (44), Celia (40), Florence (31), Gertrude (29), and Eva (29)—were unmarried when Jacob died, and they were the primary focus of his will. 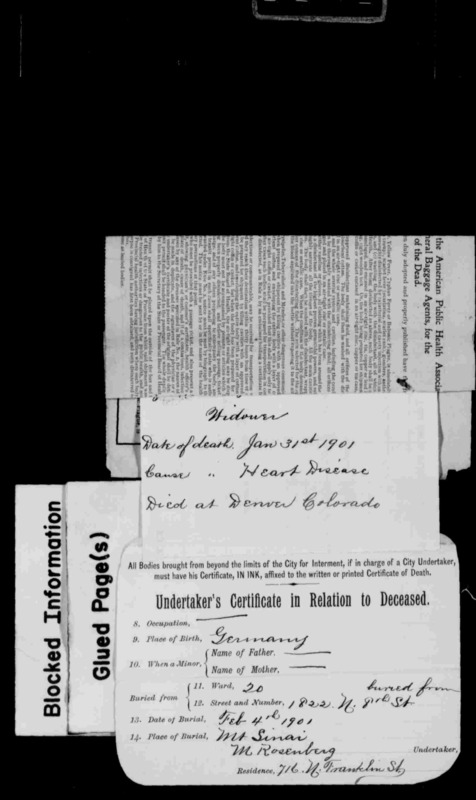 I Jacob Goldsmith of the City of Denver County of Arapahoe State of Colorado being of sound mind, memory and understanding, do make this my last will and testament hereby revoking all former wills and testaments made by me. I give, devise and bequeath unto my executors hereinafter named all my estate, effects and proceeds of Life Insurance that I may die possessed of or be entitled to: upon trust to be invested according to their discretion and judgment and all interest and income arising therefrom to be applied for the maintenance of a home for my unmarried Daughters. And it is my express wish and desire that my unmarried Daughters remain together and the money derived in the way of interest or other [?] off the principal to be paid to them in regular installments as often as practicable quarterly if possible to defray the expenses of their home. In the event of marriage of any of my Daughters or other emergency arising when in the judgment of my executors it may be advisable to use any part of the principal he shall have the power to draw upon it for such an emergency. Otherwise the Capital or principal shall remain intact until each and everyone of my unmarried children are provided for by marriage or otherwise and in the event it is found better to no longer keep up a home and any of the unmarried children may live with their Relations or otherwise provide themselves with a home then the Interest or income derived off the principal shall be divided between the unmarried children as long as any of them live and remain unmarried. After all of them have by marriage, death or otherwise so provided for that they do not any longer require that the income for their maintenance as herein provided for then the principal or Capital shall be divided share and share alike between all of my children or their heirs. 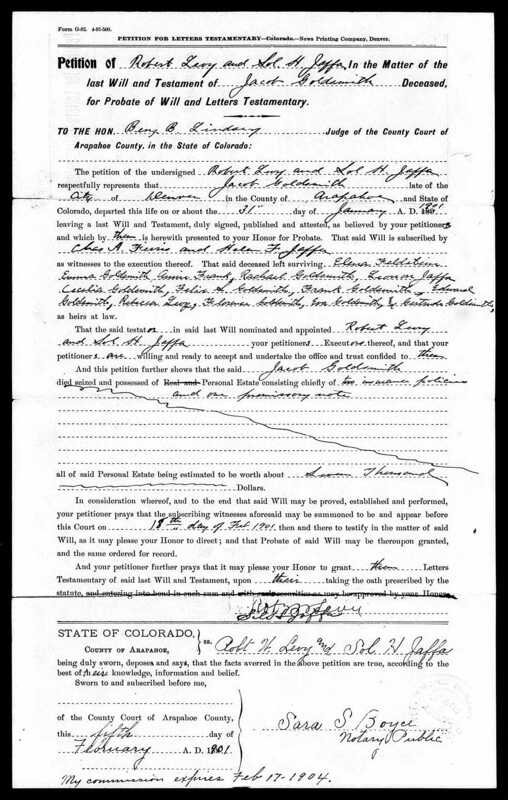 I nominate and appoint my son at laws Robert Levy of Denver Colo and Sol Jaffa of Trinidad Colo as executors of this my will, and they shall not be required to give any bond or surety for the execution of this trust. In case of the death of either of them, the children shall chose [sic] another to act in his place and in case of the deaths of both, two others shall be chosen by the surviving children. 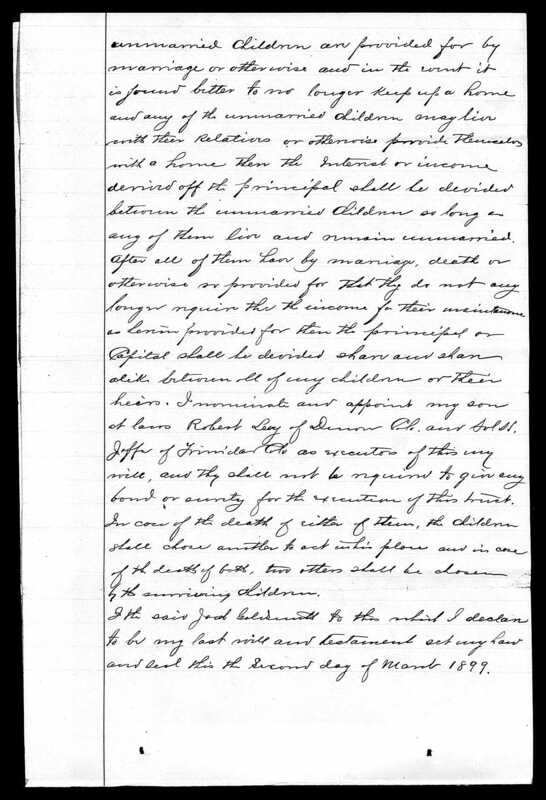 I the said Jacob Goldsmith to this which I declare to be my last will and testament set my hand and seal this the Second day of March 1899. 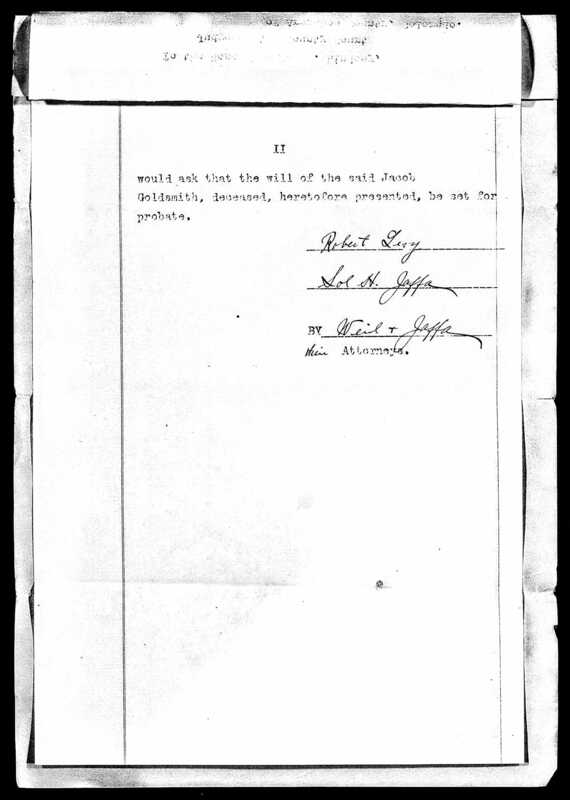 Signed by the said testator Jacob Goldsmith and acknowledged by him to be his last will and testament in the presence of us, present at the same time and subscribed to us in the presence of the said testator and of each of them. The will certainly reflects its times. The assumption was that a woman would have no means of support unless and until she married, and thus, Jacob’s will provided that the interest and income from the estate would be distributed to his unmarried daughters unless and until they married or died or found some other means of support. I also found it interesting that the will expressed his desire that these daughters would share a home together. Finally, the will stipulated that once all his daughters were married or deceased or otherwise supported, then the principal of the estate would be distributed to all his children. 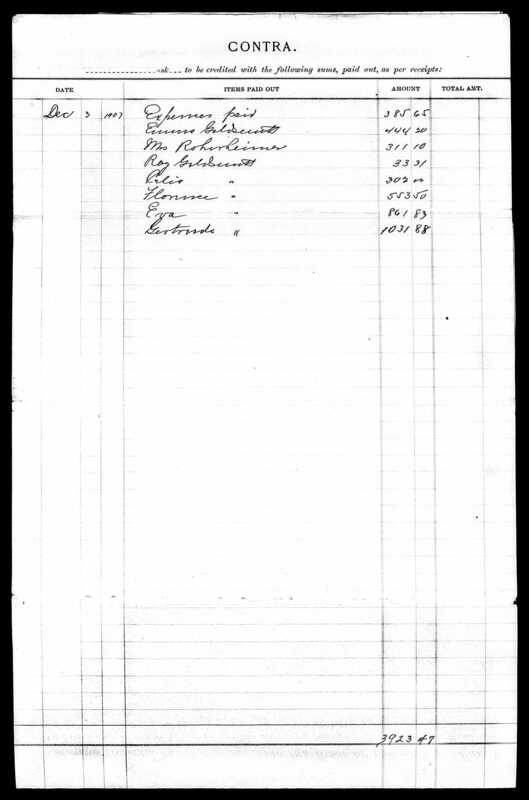 One thing that struck me as odd about this was that Jacob made no special provision for his widowed daughter Annie Goldsmith Frank or for the widow of his son George Goldsmith. Both had children, Jacob’s grandchildren, and no longer had a husband to support them. I would have thought that Jacob would have included them with his unmarried daughters in providing for distributions of the estate’s income. 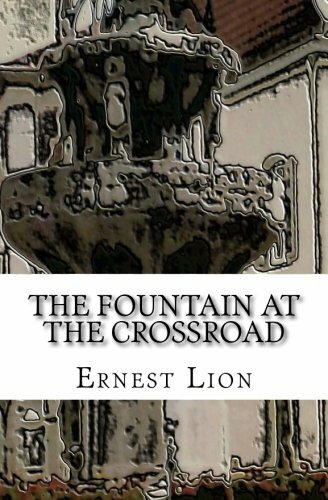 Notice, however, that the executors identified George’s children as Fanny and Esther, when in fact George’s children were Fanny and Lester. How could they have made that error? Had someone said “Lester” and Solomon Jaffa and Robert Levy heard “Esther”? I wonder whether that error resulted in any problems if and when the principal of the estate was distributed years later. And it was many years later before all of Jacob’s daughters were either married or deceased. Sadly, however, it was not long after Jacob’s death that one of those daughters died. 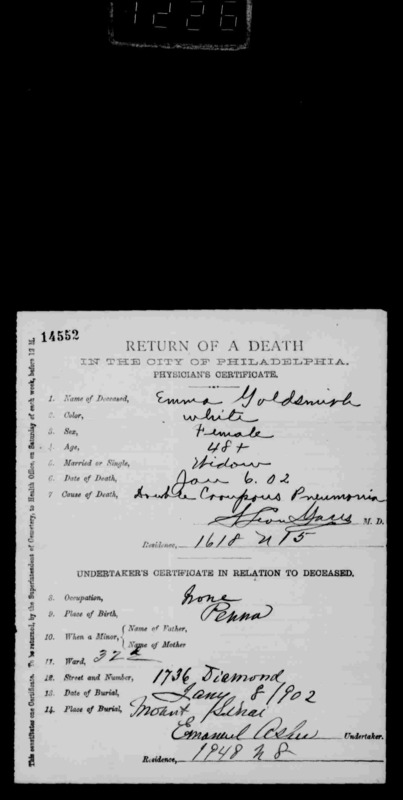 Emma Goldsmith died of “double croupous pneumonia” on January 8, 1902, in Philadelphia, where she was buried. She was only 48 years old. 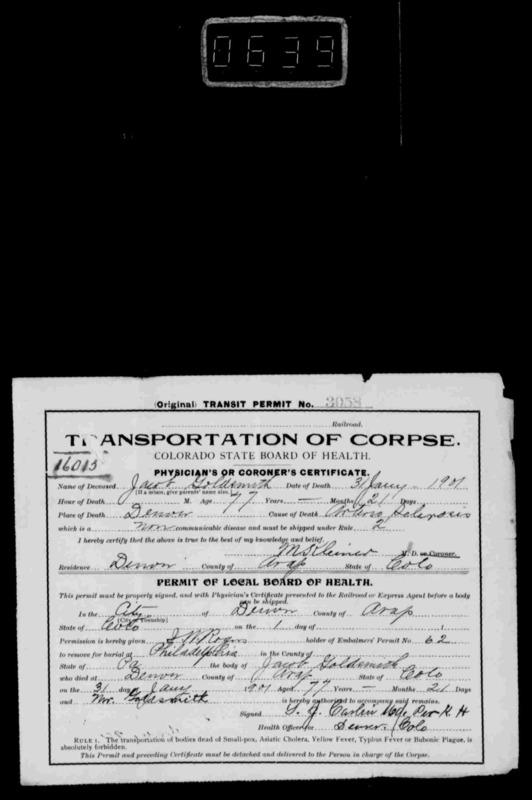 “Pennsylvania, Philadelphia City Death Certificates, 1803-1915,” database with images, FamilySearch (https://familysearch.org/ark:/61903/3:1:S3HT-665P-M?cc=1320976&wc=9FR3-YWL%3A1073330701 : 16 May 2014), 004056150 > image 1230 of 1777; Philadelphia City Archives and Historical Society of Pennsylvania, Philadelphia. I also noticed that Joseph Langer was one of the invited guests. Joseph, the Denver Post photographer I wrote about here, was the grandson of Sarah Goldschmidt Mansbach, Jacob Goldsmith’s first cousin, Eva’Goldsmith Uhlfelder’s first cousin, once removed. A year after Eva married Sigmund Uhfelder, two more of Jacob Goldsmith’s daughters married, and their husbands were brothers. They were married in a double wedding. 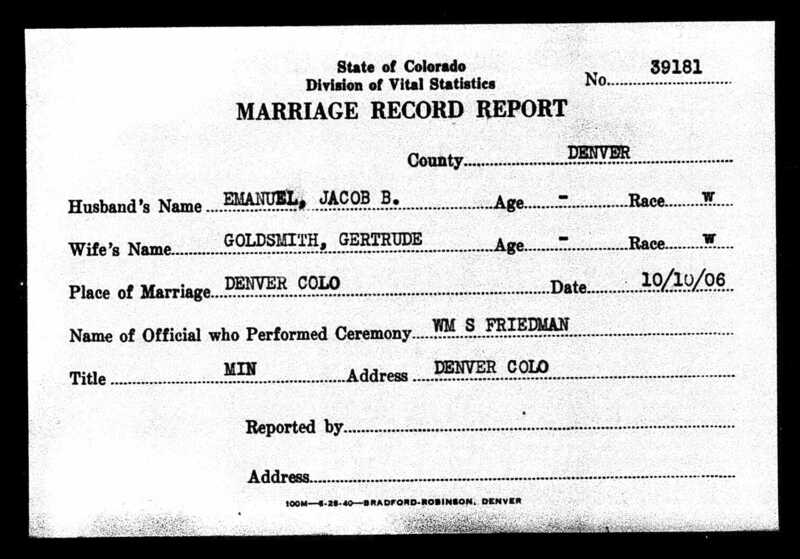 On October 10, 1906, in Denver, Florence Goldsmith, then 37, married Jerry B. Emanuel, and her sister Gertrude, 35, married Jacob E. Emanuel. 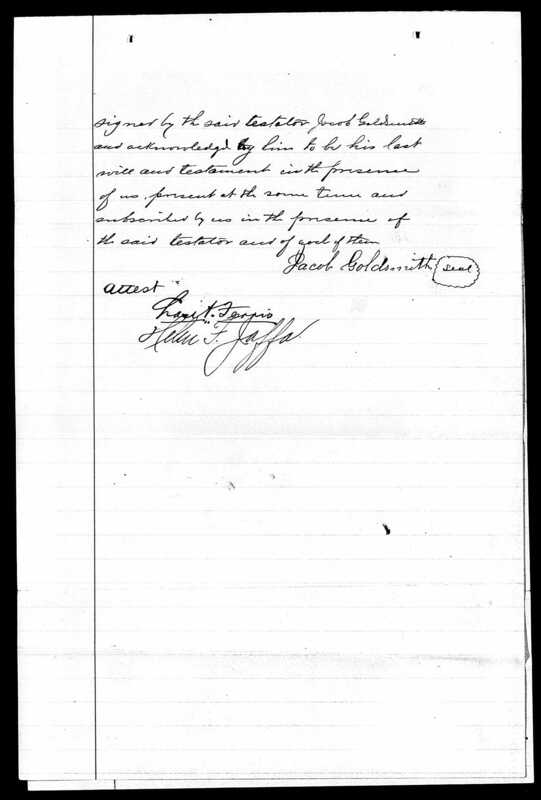 Thus, as of October 10, 1906, only two of Jacob’s daughters remained unmarried: Rachel and Celia. 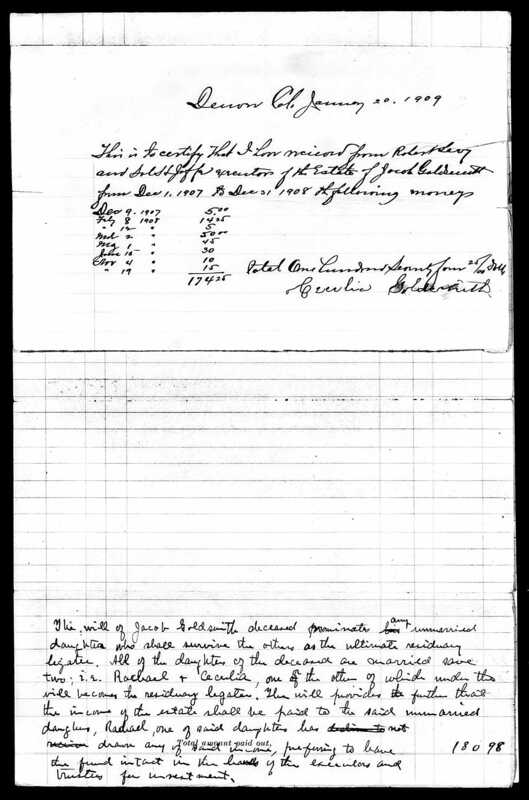 They were now the only ones entitled to a distribution of the interest earned on Jacob’s estate. I am not sure what to make of the inconsistencies in the distributions. 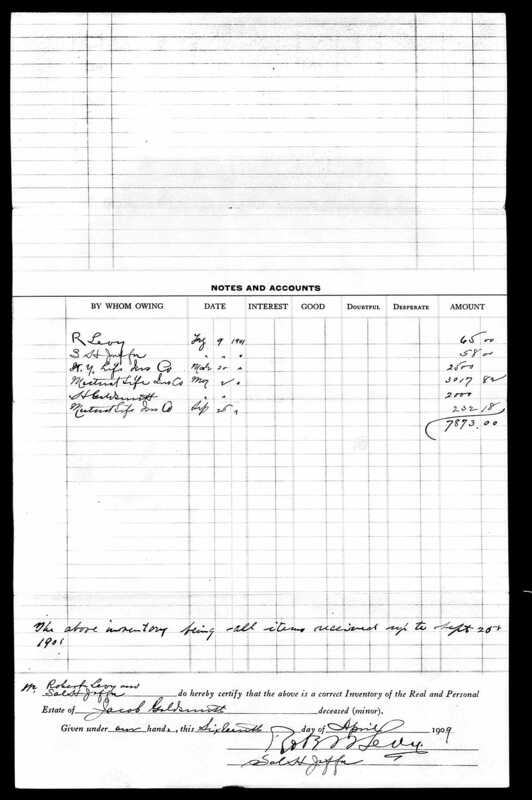 While Rachel had only received $33, Eva had received $1031. Emma, who had died in 1902, received more than Celia, who was still alive. My hunch is that Florence, Gertrude, and Eva received a bit more to help pay for their weddings, but that can’t be the only explanation. Jacob did leave it to the discretion of the executors to determine what each daughter would receive, to be determined based on their needs. Maybe the executors responded to requests made by the individual sisters. 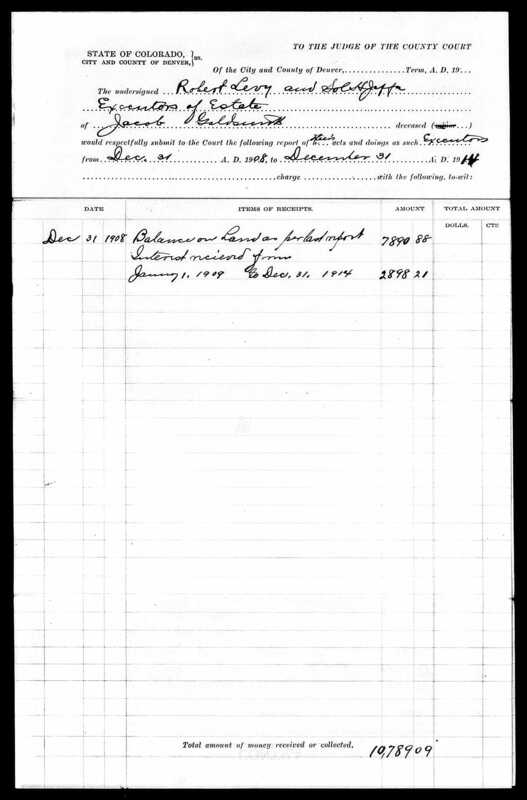 The report for the following year—December 1907 through December 1908—showed distributions only to Celia. Although Rachel was also still unmarried, she was not included in the distributions. 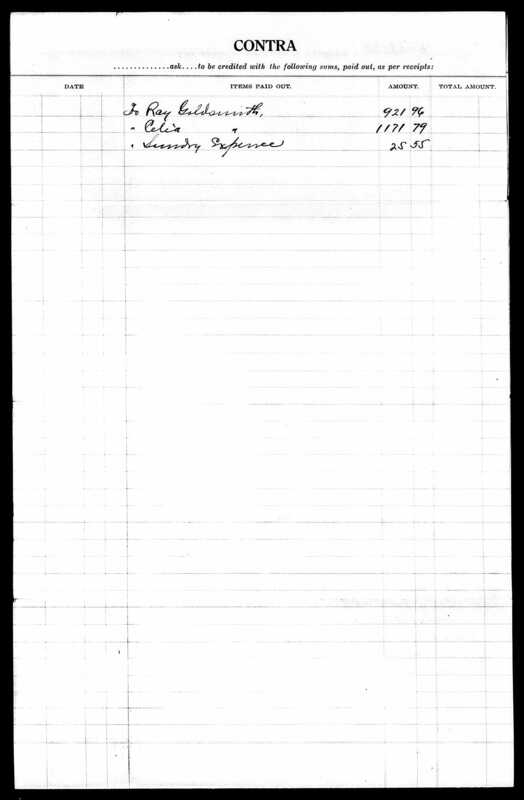 A note at the bottom of the last page of this report explained that Rachel preferred to leave the money in the hands of the executors for investment. 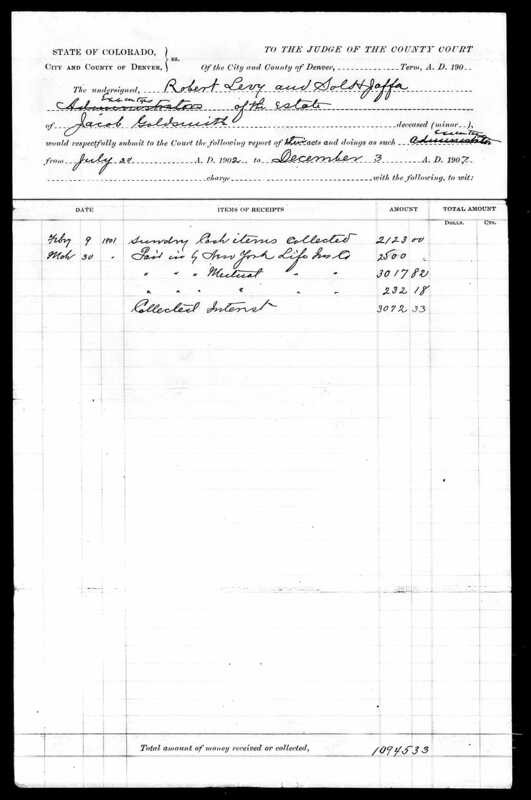 The last report included in Jacob’s probate file on Ancestry.com covered the period of 1909-1914. 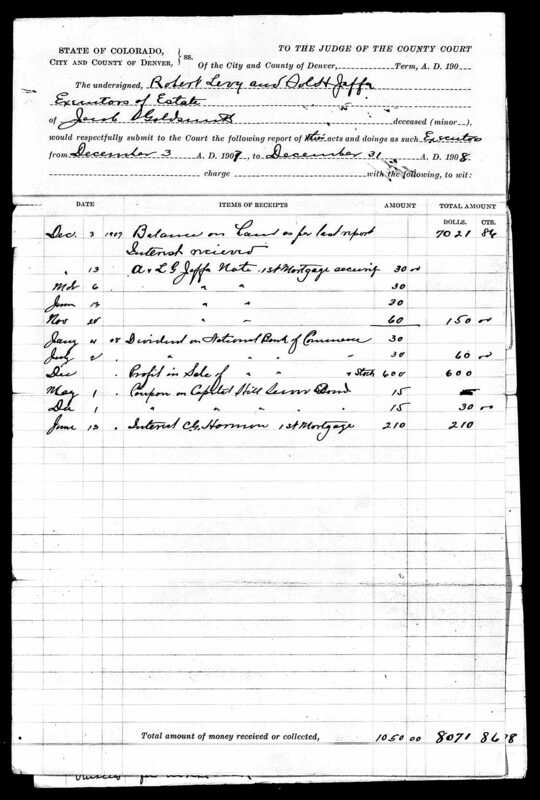 It shows that as of 1914, there was $10,789.09 in the estate. During this period, Rachel (Ray) had received $921.96 and Celia $1171.79. 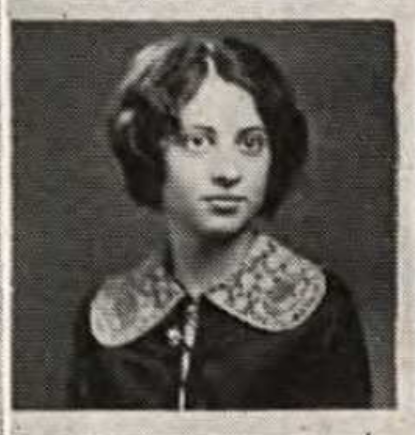 Celia was now the only remaining unmarried daughter of Jacob Goldsmith, and as we will see, she lived until 1933 and never married, meaning that the principal of Jacob’s estate could not be distributed until 1933. By then most of Jacob’s children had passed away, but some were still living, and there were many grandchildren living to inherit their parent’s share. 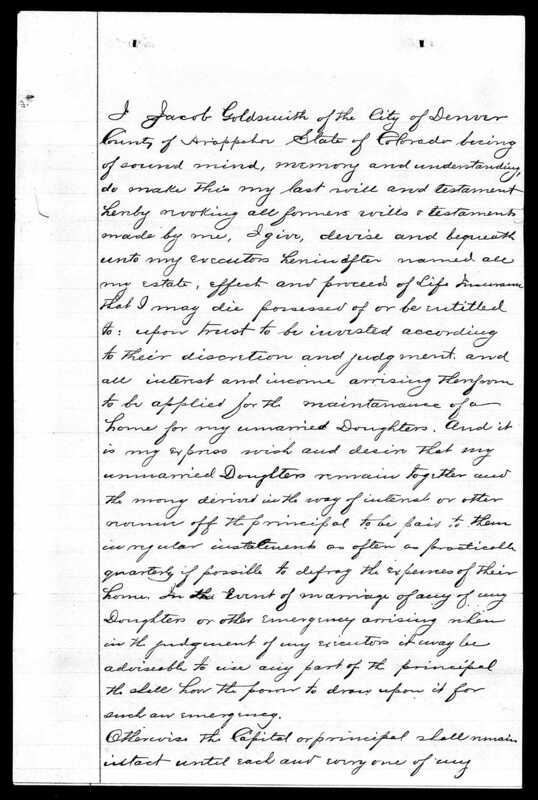 Unfortunately, there are no later documents in the probate file, and I don’t know what was left in the estate at that point or how it was distributed.